K-PAC’s Self-Contained Compactor offers end users the benefits of economics of compaction combined with liquid tight capability. The KP1SC features a large cleartop opening to accommodate a variety of compactible waste materials. A KP1HT, Hy-Tail Selfl-Containted Compactor convenient loading height makes ground level loading quick and easy. One piece construction between the packer head and container, and a 44″ liquid retention height assure leakproof performance. Increased ram pressure versus competitive models means a higher compaction ratio and reduced disposal costs. Optional: Full enclosure with side door and access interlock switch for user safety. 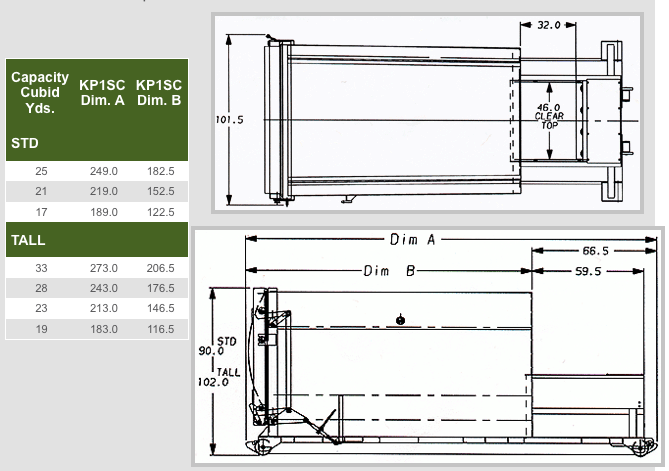 K-PAC’s curved door design adds strength and capacity to the KP1SC compactor. The doors curved design initiates a “rolling effect” on the waste material increasing compaction density. The KP1SC’s 1 cubic yard loading chamber, with a 32″ x 46″ clear top opening, and a 44″ loading height, is easy to load from a dock or ground level. A higher ram face pressure and deeper (16″) ram penetration give the KP1SC the best compaction performance in it’s class. KP1SC’s feature a heavy-duty single ratchet latch system which pulls the door tightly and evely against the door seal. K-PAC’s innovative latching system features an adjustable stop to prevent over compression and damage to the door seal… resulting in longer seal life and less downtime for seal replacement.